Maurice de Périgny. Au Maroc; Casablanca, Rabat, Meknès (1919). Meknes was known for the production of gold embroidery, silk embroidery, and in particular, embroidery on leather. It would seem, however, that Meknes lost much of its silk embroidery traditions by the early 20th century. According to the French official, Prosper Ricard, in about 1916 there was a crisis among the embroiderers in the city as a result of Fes style embroidery being introduced throughout. Based on surviving 18th, 19th and early 20th century examples, various writers have concluded that traditional Meknes silk embroidery was technically and iconographically similar to that of Salé and Fes, with a blend of Berber elements. 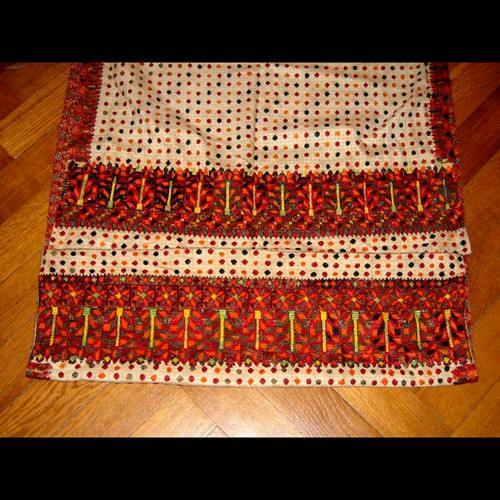 Meknes embroidery is non-reversible and at first glance appears to be counted thread work. However, it was worked on an extremely fine even weave ground material, usually made of cream coloured muslin. This material was too fine for counted thread work. In addition, the cloth was often decorated with a woven design of stripes, spots or little coloured squares. The woven design was used to provide a guide line for the embroidery. The embroidery was carried out in thick, floss silk in a wide variety of colours, notably black, brown, green, red, yellow, and occasionally blue.